Cardio Debate > Cardio Notes > Treatment and Prevention > Heart Failure – The management of Comorbidities: Is there a role for Statin therapy? 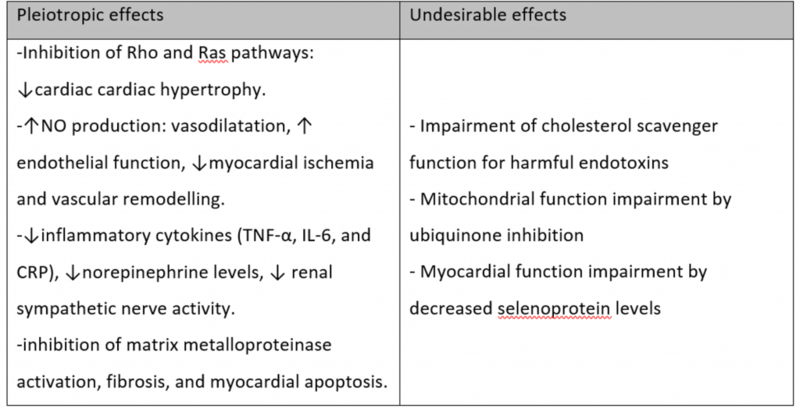 Heart Failure – The management of Comorbidities: Is there a role for Statin therapy? Whether statin treatment is useful in HF continues to be debated. Several systematic reviews and meta-analyses have been conducted to assess whether statin therapy reduces major adverse events in HF. While some studies seem to favour the hypothesis that statins –via their pleiotropic effects- may improve HF outcomes, detrimental effects of statins have also been reported in HF patients (Table). Two meta-analyses of randomized clinical trials failed to show improved survival in HF patients taking statins [1,2]. The majority of data in these meta-analyses are related to the CORONA and GISSI-HF trials, mainly including older patients and testing rosuvastatin, an hydrophilic statin with a low uptake into cardiac muscles, as opposed to lipophilic statins (i.e Atorvastatin). A more recent study yielded different results . This represents the largest systematic analysis evaluating the effect of statin therapy on HF events with over 132 000 participants from 17 trials and over 570000 patient-years of follow-up. The study showed that statin therapy reduces events in major primary and secondary prevention trials. The risk of the composite end-point non-fatal hospitalization and HF death was reduced by 10%, mostly driven by a reduction in non-fatal hospitalizations. There therefore is an ongoing debate regarding the usefulness of statins in HF and further research is needed to ascertain if the benefits of statin use might reasonably outweigh the risks of their use in HF treatment. If they are shown to reduce or reverse progression of HF beyond the therapeutic actions of some of the mainstay medical therapies, statins could merit second line or adjuvant therapy consideration in International guidelines for management of HF. 1.- Zhang S, Zhang L, Sun A, Jiang H, Qian J, Ge J. Efficacy of statin therapy in chronic systolic cardiac insufficiency: a meta-analysis. Eur J Intern Med. 2011;22(5):478–484. 2.- Lipinski MJ, Cauthen CA, Biondi-Zoccai GG, et al. Meta-analysis of randomized controlled trials of statins versus placebo in patients with heart failure. Am J Cardiol. 2009;104(12):1708–1716. 3.- Kjekshus J, Apetrei E, Barrios V, et al; CORONA Group. Rosuvastatin in older patients with systolic heart failure. N Engl J Med. 2007;357(22):2248–2261. 4.- Tavazzi L, Maggioni AP, Marchioli R, et al; Gissi-HF Investigators. Effect of rosuvastatin in patients with chronic heart failure (the GISSI-HF trial): a randomized, double-blind, placebo-controlled trial. Lancet. 2008;372(9645):1231–1239. 5.- Preiss D, Campbell RT, Murray HM, Ford I, Packard CJ, Sattar N, et al. The effect of statin therapy on heart failure events: a collaborative meta-analysis of unpublished data from major randomized trials. Eur Heart J. 2015;36(24):1536-46. Statin therapy is widely used for both secondary and primary prevention of atherosclerotic cardiovascular disease. However, information is limited regarding the role of these agents in heart failure, as the randomized trials that have provided evidence of benefit in different patient subgroups have generally included few patients with heart failure. Furthermore, results of previous studies, i.e. CORONA and GISSI-HF trials, did not yield favourable results. With this background, we should welcome results of the collaborative meta-analysis by Preiss et al, that have been well summarized by Dr. Hevia in this issue of Cardio Debate. Preiss and colleagues have shown that the composite end-point of non-fatal hospitalization and HF death was reduced by 10% in subjects receiving statin treatment, mostly driven by a reduction in non-fatal hospitalizations. In my view, and following the results of the study mentioned above, physicians should prescribe statins for their heart failure patients, as there is evidence for benefit without harmful effects. The probability exists, if evidence continues to accumulate favouring their use in HF patients, that statins can become second line or adjuvant therapy in International guidelines for management of HF. Statin Therapy in Patients with Chronic Heart Failure - Just not for all patients and not all statins? The use of statins in patients with chronic heart failure (HF) remains controversial. Despite evidence from observational and mechanistic studies suggesting that statins benefit HF affected patients, two large randomized controlled trials (CORONA and GISSI-HF) have failed to demonstrate these keenly awaited benefits. As statins are the only therapy that currently appears to improve mortality in patients with HF with preserved ejection fraction, randomized trials are now necessary to provide a definitive evaluation of this hypothesis. Until then, whether or not lipophilic-statin groups can show superior results when compared with hydrophilic compounds in patients with HF will remain a matter of debate. Preiss D, Campbell RT, Murray HM, Ford I, Packard CJ, Sattar N, et al. The effect of statin therapy on heart failure events: a collaborative meta‐analysis of unpublished data from major randomized trials. Eur Heart J. 2015;36(24):1536‐46. Ford I, Murray H, McCowan C, Packard C. Long-Term Safety and Efficacy of Lowering Low-Density Lipoprotein Cholesterol With Statin Therapy: 20-Year Follow-Up of West of Scotland Coronary Prevention Study. Circulation. 2016 Mar 15;133(11):1073-80. Fukuta H, Goto T, Wakami K, Ohte N. The effect of statins on mortality in heart failure with preserved ejection fraction: a meta-analysis of propensity score analyses. Int J Cardiol. 2016 Apr 4;214:301-306.